Every time I enter an Alterac Valley battle, it seems that there's one loud-mouth who thinks he knows everything and tries to shout directions to everyone. They think that you can only win if you do things their way. Little do they realize, even if you get half of the people to listen to you, that's not enough. Everyone's going to do their own thing, thinking they can contribute in their own way. And it never fails, a tower is not capped, a graveyard is relinquished, and this so-called leader feels it necessary to berate everyone on their team. I was just in a battle and this annoying warrior decided he was going to be the leader. He shouted at us when we didn't keep Stonehearth Graveyard, he yelled again when Tower Point was taken back by the horde, and he kept complaining all throughout the battle. A battle we won! Granted, I only earned about 450 honor, but it was a quick game, and we prevailed. Perhaps if we had listened to the annoying warrior we would have received twice as much honor, however, the match would have taken at least twice as long. Either way, I got to use my Stormpike Battle Standard on Galv and we prevailed. After Nalorakk, we headed over to Akil'zon. Before you get to him, you have to run a gauntlet as eagles constantly come down the mountain at you and guards constantly pin you in from behind while you have to keep moving forward and taking out mobs that are not crowd controllable. It took us a couple times to figure out how exactly to get through the gauntlet, but we did it and reached Akil'zon. We used our first look at him to figure out exactly how everything works during the encounter. The next time, we did much better, but still were learning the fight. The third time, we rushed up to beat the respawns, but didn't quite make it. After we failed the gauntlet on our way back up to Akil'zon, we called it for the night. After Zul'Aman, I quickly went into Alterac Valley for a couple more runs and I maxed out my reputation gains with the Stormpike Guards and was rewarded with the Stormpike Insignia. Tonight, the Gold Team ventures back into Zul'Aman. We plan on taking down both the Bear God and the Eagle God. From what I've heard, the Eagle God fight will be quite interesting with a lot of movement and coordination. Most of my time today has been spent in Alterac Valley. This weekend, the Stormpike Guard are awarding extra honor for fighting against the horde. Also, the Alliance battlemaster tasked me with the quest to win an Alterac Valley game. Today has been mostly hit and hiss. Sometimes you'll get a great group which will win handily, other times, you'll be stuck with inept people who don't understand how to work as a group. Either way, today has been very rewarding. Other than gaining almost 4,000 honor points, I also hit exalted with the Stormpike Guard! Time to update my count of exalted factions. I do believe I'm at 15 now. Well I've certainly had a productive morning. After completing the daily cooking quest and being rewarded with a recipe for Kibler's Bits, I went to Skettis and completed the two daily quests there. I then took a free ride up to Blade's Edge and did the four quests there. After that, I returned to Shattrath and was in a most spectacular Warsong Gulch group. The three priests in our group knew exactly what they were doing and healed everyone, and one was even the flag carrier! We worked very well together as a team and quickly won 3-0. That was my daily battleground quest, so I decided to keep pushing my luck and flew over to Honor Hold. I picked up the daily quest there and recaptured the three towers. Our small group met resistance at one of the towers, and after I took out 2 of the five, I was quickly dispatched by the warlocks in the group. After resurrecting though, I made it back in time to complete the objective, giving me 9 out of 10 daily quests done. Now, I'm not sure which other ones I can do. I think all that's left for me is the daily instance quests. On an unrelated note, I recently let my Spellfire cloth making ability go unused. I have 16 Spellfire Cloth sitting in the bank and I am unable to sell them. I don't feel like going out and grinding primal fires and mana, so I think I'll just look for someone wishing to buy my services in the trade channel. If I have to spend 50g on primals to make the cloth, and then can't sell it, it's just a waste of money and there's nothing I can craft with it. My only other option at the current time is to try and trade Spellcloth for Primal Mooncloth. If I can get 8 of them, I could create a Primal Mooncloth Bag and add a couple of slots to my bags. Last night, we almost ran a perfect Karazhan run. 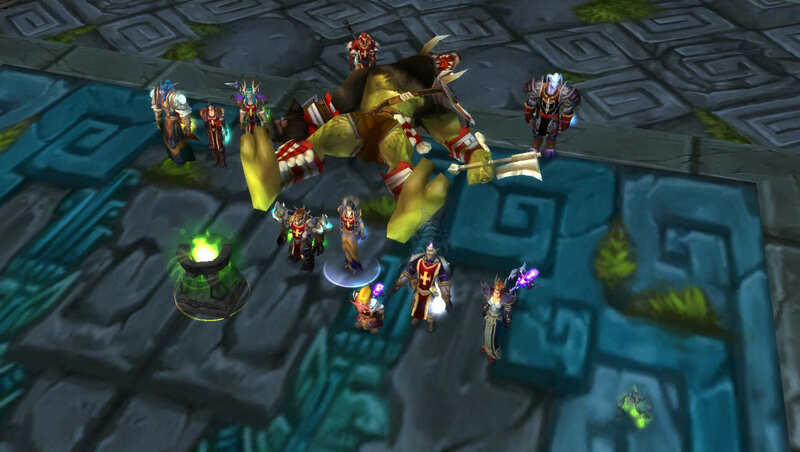 Not withstanding a few minor incidents, we cleared Karazhan in under five hours and were rewarded with 23 badges. We went our usual way, starting with Moroes, then Opera (Roumlo and Julianne), Curator, Aran, Netherspite, back to Illhoof (forgotten after Aran), then Prince, and Nightbane. 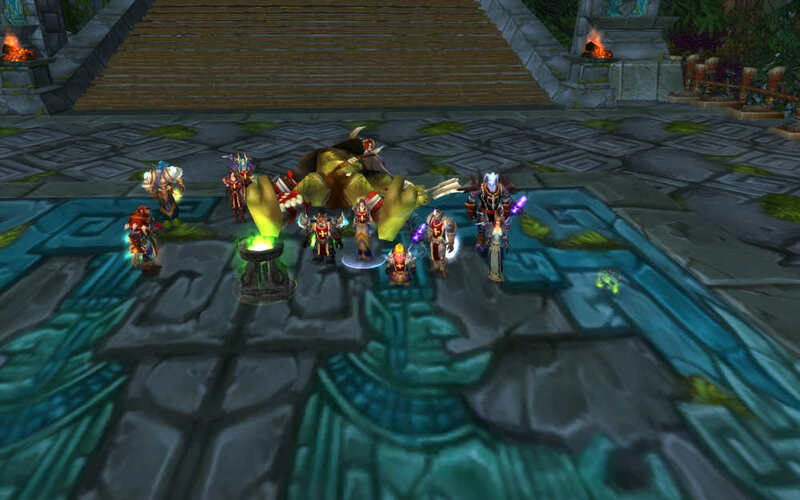 We then cleaned up when we realized we had some time left and took down Attumen and The Maiden. 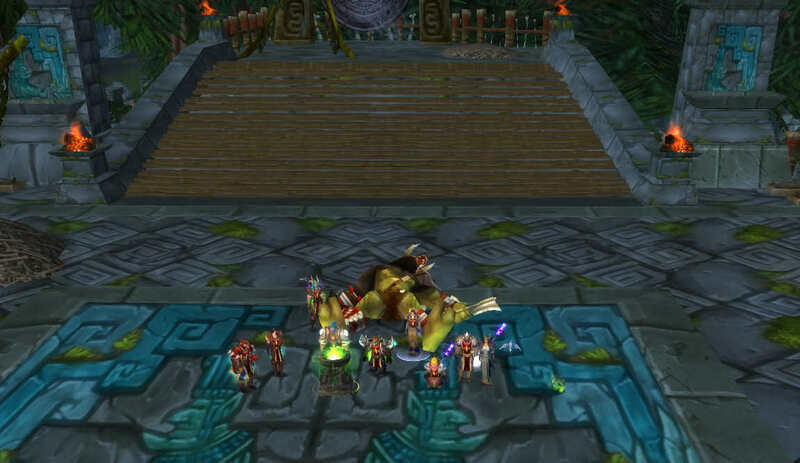 We had a slight hiccup on Aran where someone moved (a lot) during a flame wreath (never figured out who), and then we had one quasi-wipe on Nightbane. After Aracely went down, he decided to chomp on me while the others ran for the door to reset him. A quick regroup later, we took him down and claimed our prizes. To my surprise, the Prince actually dropped a "Fallen Hero" badge which was won by Comador. Both Nefernetcher and I did not need it, though both of us would take it for the Tier 4 bonus, and also just to complete the set. We we were both happy it went to Comador, as it was an upgrade for him even before socketing. This weekend is Alterac Valley weekend, so I plan on spending a bunch of time in there in anticipation of the third arena season starting up next Tuesday. 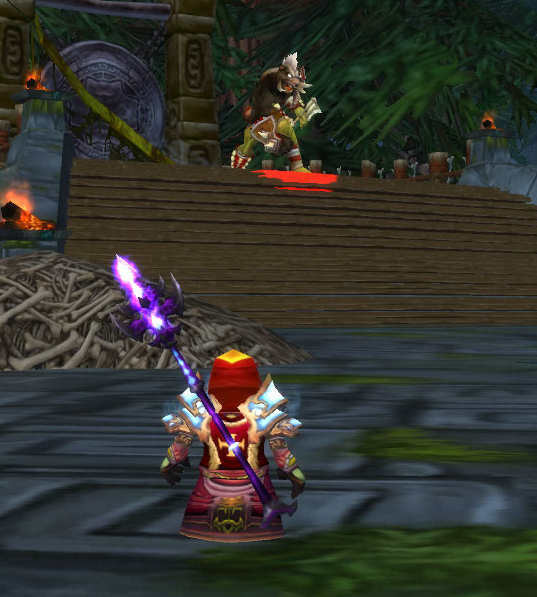 Of course, I also have to get my arena matches in and on Friday, we venture back into Zul'Aman. Early this morning, I ventured over to the Alliance Quartermaster to see what wares I could possibly purchase. However, I had forgotten that the third season of the arena competitions had been pushed back a week. He did inform me that I had accumulated 8,064 honor points to spend, which is a good start to the 27,094 needed to upgrade my pendant and silk cuffs. With that in mind, I ventured over to the Arena Battlemaster and he informed me that last week, I had accumulated almost 500 arena points, bringing my total to 1,101. However, I'm undecided as to how I will use these points. To buy the full Vengeful Gladiator's set, I need over 12,000 points which, at 500 points a week is over 24 weeks, or 6 months! So the first thing I need to do is prioritize the pieces that need upgrades. I love my Spellstrike set, but I think getting the Vengeful Gladiator's Silk Trousers and Vengeful Gladiator's Silk Cowl will be a very nice upgrade. The Silk Cowl provides 31 more stamina, 11 intellect, 8 crit, 1 damage, and 33 resilience at the cost of 24 hit. Since my hit rating is already so high for raiding, the loss makes no difference in PvP. The trousers supply me with 35 more stamina, 26 intellect, 7 crit, and 30 resilience at a cost of 30 hit, and 8 damage. Additionally, I receive a bonus of 35 extra resilience when sporting two of the Vengeful Gladiator's Set. However, these two items will cost me 3,750 arena points. At 650 points a week (I'm hoping to join a 3v3 to gain a few extra points), it'll take me just over 4 weeks to reach the goal. Which, as I do the calculations is quite reasonable. The next three items - shoulders, chest, and hands will require an additional 4,304 arena points - or 7 more weeks of arena action. Alternatively, I could shoot for the awesome Vengeful Gladiator's War Staff which is absolutely amazing for both raiding and PvP. It offers just one more stamina, but 46 more crit, 62 more damage, and 29 resilience at the cost of just 5 intellect and 23 hit. However, not only does it require 3,750 arena points, it also requires a personal rating of 1,850. Though I have not yet acquired a personal rating, I might have to be picky as to which matches I play, and whom I play with. And I'm not really sure if I want to do that. I enjoy playing matches with Mercreus, even though we have a losing record. But if I have to keep a personal rating up (or even get it up in the first place), I may not be able to play those matches. Well tonight certainly was interesting. We ventured back into Gruul's lair, but the mage that usually leads the charge was absent tonight, so it fell to me to tank Krosh. Luckily, when we were first preparing to enter Gruul's Lair, I had spent quite a few gold on a Krosh tanking set (lots of stamina). I had tried to tank him in the past, but our healers didn't know the encounter, and neither did I. 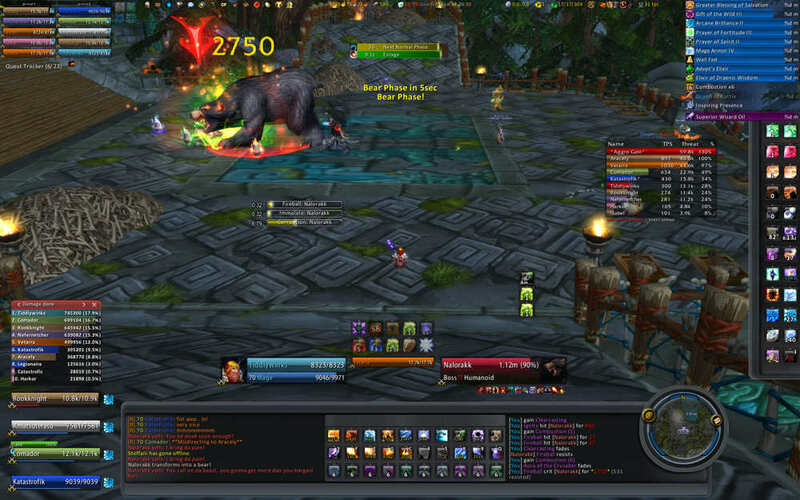 Now that we are all used to it, I was able to successfully tank Krosh and we quickly downed Maulgar. It's really a different fight while tanking Krosh. You really don't see anything going around you. I just stood there, cast some scorches and stole his spell shield whenever it was up. I completely ignored everything else going on. It was pretty fun since if I died, there was a wipe. It's not often as the mage that you get that sort of responsibility. After Gruul's Lair, we quickly headed over to Karazhan and downed Nightbane. A quick one shot later, I received two badges and was able to pick up my Carved Witch Doctor's Stick. I also received a Faint Arcane Essence which was required for a quest which rewarded me with an Infused Amethyst (+6 spell damage, +6 stamina). As it happened, the Witch Doctor's Stick had a blue socket and the Infused Amethyst fit in perfectly. I am quite happy with my new wand and now must grind some honor points over the next week or so. Following up on the downing of Nightbane and clearing of Karazhan, we decided to push our luck and travel back to Zul'Aman. We learned much from our first excursion and quickly cleared back up to Nalorakk, the Bear God. 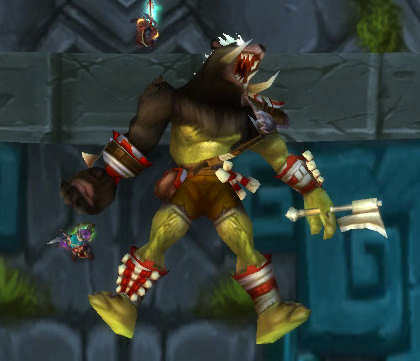 Nalorakk is an ugly troll who, as the bear god, transforms periodically into a gigantic bear. He continually switches back and forth and has quite a bit of health. It's was a test of the whole group as we just needed to stay alive and work together. Eventually though, we took him down. Well, yesterday, after actually winning an Eye of the Storm match for the brigadier general, I flew up to Netherstorm to collect Mana Berries and then ventured back to Winterspring. Just as I was about to be friendly with the Wintersaber trainer, he offered me another option to gain reputation with him - I think I mentioned it last time - but it significantly sped up my gains. I am now friendly with the Wintersabers and reached Honored with the Timbermaw - granting me a new enchanting and tailoring recipe. Quite honestly, I'm not sure how I'm going to be able to survive these grinds. They are slow, repetitive, and boring. But hey, sometimes you just have nothing better to do - though grinding primals would make more sense fiscally. Tonight I believe we will venture back into Gruul's lair. Hopefully he will drop a Badge of Justice. If they drop in Karazhan, why not there? I am just one badge short of my new wand - the Carved Witch Doctor's Stick - an upgrade of 5 stamina, 6 intellect, and 10 damage, at a loss of 11 hit. Should be worth it. I'll have to make up for hit in another slot though. Might go back and resocket my Spellfire to adhere to slot bonuses. Not quite sure yet though.